My grandfather’s mother, Mariam was Iraqi from Baghdad and used to make Middle Eastern meatballs called Kibbeh for my dad. Falafal’s carnivorous cousin is the national treasure of Syria and Lebanon. It is ever-present along with other delightful small bites called mezze at gatherings. The outer layer of ground meat and bulgur (cracked wheat) is stuffed with more ground meat seasoned with aromatic Arabic spices, onions, garlic and toasted pine nuts. Food brings fond memories to mind and often serves as an expression of affection. Dad tells me that both his grandmothers were great cooks. He recalls his mom’s mom, Sokhak taking him hunting for wild capers when he was a little boy. He would jump the fence while she waited, gathering her apron like a basket. He would make trips back and forth, carrying small batches to her. Then they would go back to her little kitchen to brine them. How delicious those capers must have tasted. On his father’s side, Dad’s grandma Mariam made the best kibbeh and while it’s readily available in Middle Eastern groceries, Daisy and I carry on her legacy by making them from scratch. Every family has a signature recipe. There are many variations, ranging from purely vegetarian with pumpkins or potatoes to fish, lamb, beef or chicken. Kibbeh also takes on two forms, one of which is that of a round pie called “Kibbeh Sini,” sini meaning serving tray. It is more often seen as cute, little individual football-shaped dumplings which take a bit more effort. Both the envy and admiration of their husbands and other women, some women are believed to be blessed with having a good hand at shaping the popular torpedoes, all the same perfect shape, all the same perfect size. Bake them. Boil them. Fry them. 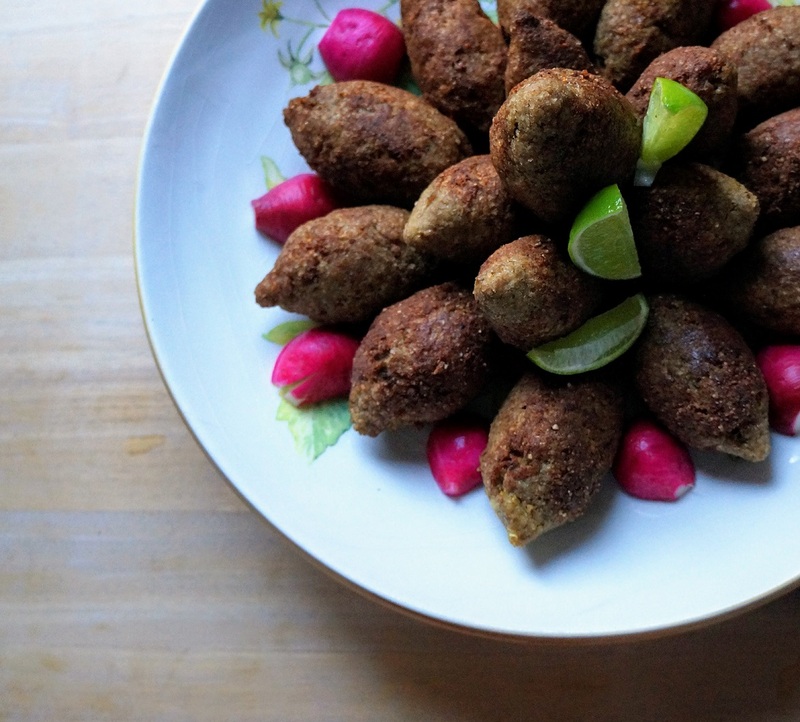 Whatever you do, Kibbeh is delicious, if prepared well. Remember that the flavor of ground spices tends to dissipate quickly. Make sure yours are fresh so they impart good flavor to your dishes. The list is short here with cinnamon, allspice and cumin. So it won’t snag too much of your time to toast them whole and grind them just before getting started. That way, you are promised an aromatic batch of little football-shaped dumplings. If you are unfamiliar with bulgur, you should definitely work it into your pantry. It’s cracked wheat ground to different consistencies, the finest of which is grade #1. The #4 consistency cooks up beautifully and is a fun, chewy change from the old rice. To make the kibbeh gluten-free, substitute cooked quinoa for the dry bulgur. The instructions seem long, but the filling can be made ahead of time and stored in the fridge or frozen. With some practice, you’ll be shaping and stuffing these lemon-shaped dumpling as beautifully as a Syrian grandmother! Kibbeh freeze well, too. So make an extra batch for a quick, but wholesome weeknight meal. Put the kettle on and gently boil some water. Transfer the bulgur to a bowl and gently rinse several times with water. Cover the bulgur with hot water and let it rest for 30 mins. To make this gluten-free, cook 1 cup of quinoa til soft, then set aside to cool. Use the flat of the knife blade to give the garlic cloves a good bashing. Then mince finely. Set aside for the garlic to rest at least 10 mins. In the meantime, set a dry pan over medium heat and toast the pine nuts. Watch carefully as they tend to burn very quickly. Drizzle a bit of olive oil into the same pan and place it over medium heat again. Chop 1 of the onions and fry to a golden brown color. Drain the bulgur and gently squeeze excess water out. Transfer to a clean bowl. Peel the other onion, cut it into quarters and toss into the bowl. Add 1/2 the meat, season with salt and pepper. Working in small batches, blitz to a paste. Add garlic and the remainder of the meat to the frying pan. Add spices and pine nuts to the mix. Take a level tablespoon of the bulgur-meat mixture and roll it into a smooth ball. Roll it between the palms of your hands to elongate the ball into more of a lemon shape, pinching the ends a bit. Pierce one end with your index finger to create an opening for the stuffing. Insert your thumb and gently roll the mixture in the palm of your other hand to thin casing as much as possible. Fill the dumpling with the fried meat mixture and seal the open end. Add a bit of the casing mixture to the ends and pinch to make them pointy. If the casing cracks, just pat a little bit of the casing mixture and smooth it over the crack. Set onto the parchment paper and continue shaping more dumplings. Add more olive oil to the pan and set onto medium heat again. Cook the kibbeh dumplings, turning carefully to brown on all sides. Do not overcrowd the frying pan. No more than 5-6 dumplings at a time should be in there. Collect the rest onto the baking tray until there is room in the pan for frying them. Turn the dumplings gently to brown all sides and collect in an ovenproof pot with a lid. Keep warm @ 200*F in the oven until ready to serve. Serve with fries, lemon wedges, yogurt, fresh herbs and a fresh salad. I love kibbeh (without the garlic, of course!) – and yours are beautiful! Colette, your kibbeh brought back memories of the year we lived in Santo Domingo. We went with friends to a softball game and they sold kibbeh for snacks like hotdogs are sold here. They were delicious and I’m sure yours are even better. Dear Colette, your Kibbeh looks absolutely amazing!!! This is such a wonderful, traditional dish and your presentation is picture perfect, my friend! Hope you and your lovely family are doing well! Dear Andrea! Some food is very difficult to photograph. So I’m glad you approve of the kibbeh ones.